It was during this absence of rules, Pinterest, or an audience beyond each other, that my fellow brand new bloggers and I enjoyed playing a little internet game where you answer a series of questions and then “tag” the other five friends on your blog roll to answer the same questions on their blogs. It was a great way to get to know each other (minus real names, of course!) before Facebook was mainstream or Instagram existed. It’s been years since I’ve done a meme like this, but recently I was “tagged” by my friend Kate (last name omitted for the sake of national security) from Centsational Girl and it brought me back to the fun we used to have back when we were too embarrassed to admit to anyone but our “internet friends” that we even had these strange new things called blogs. 1. Share something you’ve pinned (or bookmarked) and why you love it. G and I are currently building our dream home, so all pins and pictures saved point to our new house. One of my favorites is this living room inspiration picture from Ballard Designs because it mimics the light and airy feeling we hope to have in our future living room. I’m crazy about the mix of textures, and the high contrast of light neutrals with pops of dark browns and blacks. We’ll also have a beautiful wooded view outside our living room windows, so I love seeing the greenery both outside of these windows and brought into the home. This is the kind of image that has me SO EXCITED for our house to be completed! 2. What’s your favorite color and where have you used it or seen it used in a beautiful way? My favorite color is orange, but I don’t like to be all in your face about it. I prefer to use it in moderation and in a way that makes it feel special. For example, if I’m wearing orange it’s likely an orange statement necklace or a pair of orange stilettos – not the entire outfit. 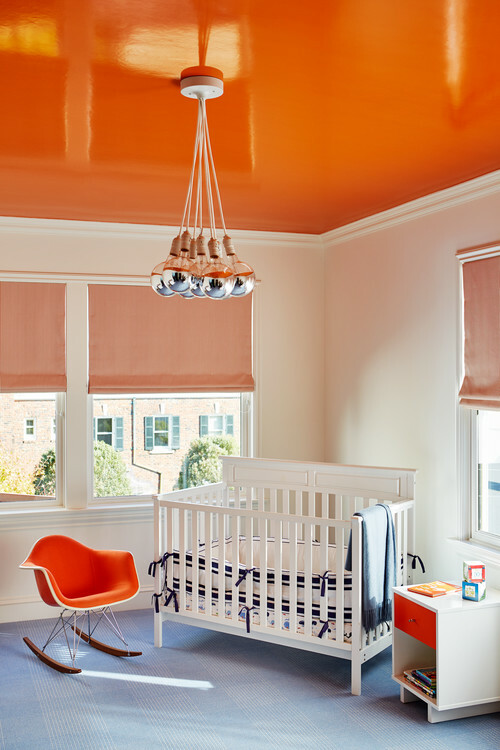 My favorite use of orange lately is this orange ceiling – how gorgeous is that?! It’s a beautiful way to bring in a bold punch of color without clashing with the rest of the room. And the fact that they did it in a high gloss sheen is all, “Oh yes, we want you to look at me.” Loud and proud. Love it. 3. If money was no object, what’s something you’d buy right now. 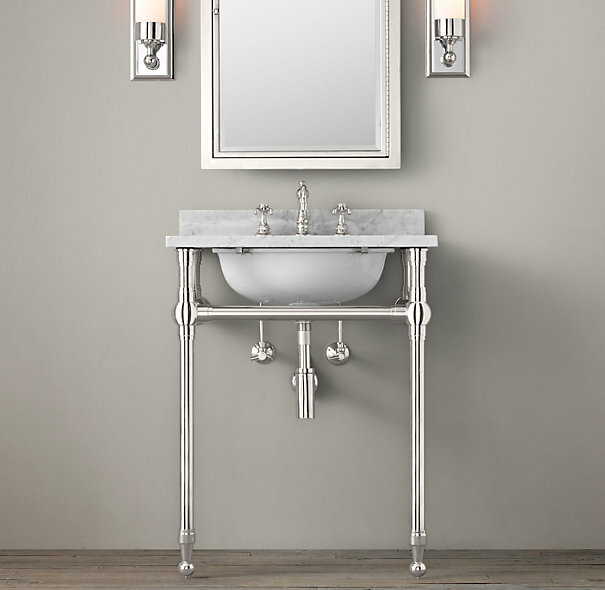 I want this gorgeous metal sink sooooooooo badly for the powder room in our new house that I’m seriously considering pimping out G in exchange for Restoration Hardware gift cards. Ladies, you know how to reach me. 4. Share something that scares you, something that comforts you, or both. This is the kind of question that should come with a couch and an hourly fee. There are plenty of things that scare me, but instead I’ll share one of my favorite comfort items – the t-shirt quilt my mom made me for a high school graduation gift. During my senior year of high school she started slowly confiscating my t-shirts on laundry day. By the time graduation day came around she surprised me with a quilt made from my basketball, volleyball, cheerleading, and various camp and club t-shirts. She even had some t-shirts added to the quilt from when I was a kid! My friends all wrote messages on it at my graduation party which makes it even more sentimental for me. Snuggling up with this quilt is always a comfort for me – I’ve been doing it every evening for nearly 20 years! 5. The perfect meal? Name it. No matter how good the food is, it’s the company surrounding you that makes it perfect. G, Kate and I are living with my in-laws while our house is being built, so lately my idea of a perfect meal is when the five of us (me, G, Kate, Grandma Pam and Grandpa Steve) are all home and sitting down together catching up on our days. It feels remarkably centering to have my daughter, her grandparents and my husband sitting around me, enjoying a meal. 6. What’s one decorating piece of advice you swear by. Hanging wall art at eye level. I’m all for throwing out the rule book when it comes to decorating, but the one thing I’ll never be able to get behind is wall art that is hung too high. It makes me so uncomfortable to see! It’s like seeing someone with food stuck in their teeth. Should you say something? Should you not? Do they know? What if they find out later and realize you must have known and you never told them? I can’t handle this kind of drama. Please, just hang your pictures where your peepers peer. The Bachelor, The Bachelorette, Bachelor in Paradise, Bachelors in AA – that whole crazy franchise. I’m obsessed with Kaitlyn and Shawn right now. I really think they’re going to make it, guys! 8. Tell a joke, the cornier the better, or share a meme or show that makes you laugh. 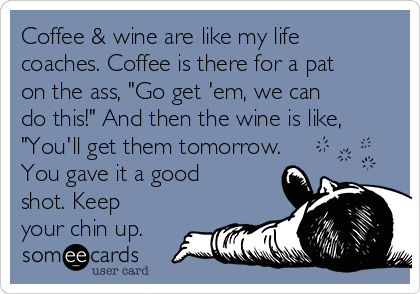 I’m not a very good joke teller, but one thing that makes me laugh is Someecards. They’re one of the few things I see online that I seem to find funny every time! Italy! It’s the place I want to visit more than anywhere in the world, but G insists it’s unsafe to travel there because 15 years ago he heard about a tourist getting stabbed. 10. What advice would you give your twenty something self? Now I pass this meme on to you! How would you answer some (or all) of these questions? I’d love hear! So fun! I may just have to follow in your footsteps and answer these great questions on my blog too! Please do, Kimm! I realized when looking back at these “tagged” posts that I did in my earlier days of blogging that it’s also a fun way to document your likes, personality, opinions, etc. at that point in time, and then look back on your answers years later to see if and how you’ve changed. I love that about blogging! Count me in on that Italy girls trip please. We can hit up Scotland one day, too. PS– that Ballard Designs room is perfection. I cannot wait to see your new home finished! I want to sit on that white sofa and fill that dough bowl up with popcorn and spend a whole weekend with you. Oh yes, you’re coming with me on my stabbing trip to Italy FOR SURE! We’ll swing by Scotland first to grab Jamie to protect us. Can’t wait for you to come to Cambridge and join me on my big white sofa surrounded by dough bowls – my Whirley Pop and a bottle of wine will be the first things I unpack! I’m in on Italy too (if you find yourself short on volunteers, which is totally plausible, right?). I went there in college and am dying to go back! Italy, Party of 3 (so far). Got it! Does G really think Italy is unsafe to travel? I hope not! You should definitely go. If I could travel around Europe by myself with no problems then you can totally do it! It is beautiful there, especially in the Cinque Terre! I believe he truly did at one point. Now I’m not sure if he still does, or if he just continues to say that so he doesn’t have to go. Hmm… And you traveled Europe solo? Wow! WTG, girl – that’s amazing!! I’m sure it was an unforgettable trip. Someday I WILL get there! I truly just laughed out loud, Ellie B!! TOTALLY missed that extra “s” when I was giving my post the quick read-over before publishing. Too funny! Yes, I’m collecting husbands along with dough bowls and trips to Italy, haha! Will edit it now. Thanks so much for the catch! ??? There were a ton of do it yourself and home decorating blogs years ago. I think you might be flattering yourself. Flattering myself is one of my hobbies, so you’re probably right. It’s been so long but YES I totally remember this! Your whole dioection or how the blogging world use to be….YEP😂.